The Washington Master Chorale today announced that it is a grantee recipient of Bloomberg Philanthropies’ Arts Innovation and Management (AIM) program. The invitation-only program seeks to strengthen the organizational capacity and programming of small and mid-size cultural organizations within Atlanta, Austin, Baltimore, Denver, New Orleans, Pittsburgh and Washington, D.C. Through the $43 million multi-year initiative, Bloomberg Philanthropies will provide unrestricted general operating support as well as arts management training in areas that include fundraising, strategic planning, marketing and board development. Gloriae Dei Cantores releases All-Night Vigil, Op. 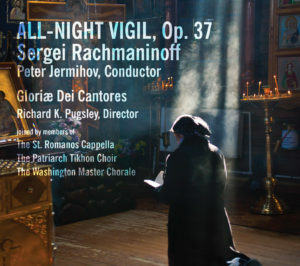 37 by Sergei Rachmaninoff, conducted by Peter Jermihov (internationally recognized specialist in Russian and Orthodox liturgical music) and produced by Richard K. Pugsley , director of Gloriae Dei Cantores. Expressing their ongoing vision of unity through music, Gloriae Dei Cantores is joined by members of the St. Romanos Cappella , The Patriarch Tikhon Choir, and The Washington Master Chorale. Soloists Dmitry Ivanchenko and Mariya Berezovska, of the National Opera of Ukraine in Kiev join the seventy-seven singers for this landmark collaboration. Vadim Gan, protodeacon under the First Hierarch of the Russian Orthodox Church sings the clergy exclamations with Dmitry Ivanchenko. All-Night Vigil was recorded by legendary sound engineer, Keith O. Johnson from Reference Recordings. The Washington Master Chorale presented four works by living composers on Sunday afternoon at National Presbyterian Church in a lithe and nimble performance that underscored how the marriage of voices and instruments can create otherworldly sounds. With artistic director Thomas Colohan conducting, the chorale’s 54 members sang with zest in the premiere of Jennifer Higdon’s “Ruminations.” Commissioned by the chorale, the 17-minute setting of poems by the Persian poet Rumi offers some of the composer’s signature gems: colorful melodies floating over rhythmic material, chameleon-like harmonics, shimmers of sound — all grounded in a logical structure that allows for interpretive elasticity. Washington Master Chorale’s next concert–on March 5 at National Presbyterian Church, called Time and Memory–includes the world premiere of a new piece by Pulitzer Prize winning American composer Jennifer Higdon. Classical WETA morning host David Ginder chats with Jennifer about the particulars of the commission, choosing the text, and bringing a new piece to life. Washington Master Chorale’s March 5th concert (at National Presbyterian Church) is called Time and Memory. It includes the world premiere of a newly commissioned work by Pulitzer Prize winning American composer Jennifer Higdon, plus John Corigliano’s Fern Hill and other pieces on nostalgia, love, and immortality. Classical WETA morning host David Ginder chats with Master Chorale Artistic Director Thomas Colohan about the Chorale’s goal to add new works to the repertoire, the thrill of commissioning and premiering a new piece, and the inclusive and welcoming themes of the March 5th concert. Watch this video about the creation of Robert Kyr’s Song of the Beloved. Kyr’s commission was made possible by a generous gift from the Fetzer Institute whose work reflects a belief in the transformative power of love and forgiveness. Texts were drawn from such disparate sources as Sappho, Emily Dickinson, Walt Whitman, Sir Philip Sidney, Vietnamese poet Thich Nhat Hanh, East Indian Rabindranath Tagore, and others. A letter of appreciation from choral great, Alice Parker. Washington Master Chorale Artistic Director Thomas Colohan received an “Ovation Award” in recognition of his achievements as “Best Director in a New Position.” Maestro Colohan received the award at the 2nd Annual Greater Washington Choral Excellence Awards ceremony sponsored by the Choralis Foundation. The Choral Excellence Awards were created in 2010 to honor and celebrate excellence and achievement in choral arts in the greater Washington, D.C., area. The award winners were announced at their Gala Dinner and Awards Ceremony on June 1, 2011, at the Clarendon Ballroom in Arlington, VA.